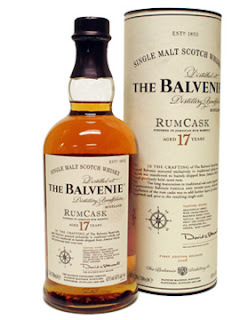 Recently I had the chance to taste a simply delicious liquor: The Balvenie Rum Cask 17-year Scotch. Is it enough for a product to be delicious? Or must it also be representative of its type? As the name suggests, this Scotch finished its aging in casks that previously held rum. It was excellent: It smelled like a good baba rhum dessert. The mouthfeel was super-smooth, and the finish was very long. If I didn't know better, I would have thought it was a super-premium rum, maybe some previously unknown version of Havana Club aged 10 years or more. That's the problem: This Scotch costs $130 a bottle, and it tastes like a delicious rum. Does that justify its existence? My initial impression was yes: Anything that's delicious deserves to find a market. Narsai David was dismissive; he said that there's no reason for a Scotch to taste like rum when there are so many fine rums available. It's an interesting question. I don't mind flavored vodkas, but I have always turned up my nose at flavored rums because, while vodka is a mostly-flavorless mixer anyway, I think rum should taste like rum. So why am I accepting of Scotch that tastes like rum? I don't want to suggest that Narsai and I were just hanging out sampling Scotch; we were at a Balvenie pairing dinner at Le Colonial restaurant in San Francisco. Chef Joseph Villanueva made his most successful pairing with the rum-casked Scotch: Coconut braised pork belly with quail egg, parsnip puree, hosui pear, savory caramel sauce and white truffle oil. The dish played well with the sweet nose of the Scotch. Balvenie wanted to prove that its Scotch pairs well with different kinds of food. I'm not sure why this is important, as most dinners leave plenty of time later in the evening to drink Scotch. But it was a good chance to taste the Balvenie lineup: I liked the 21-year Portwood quite well ($120), but I think the best value was the 12-year Doublewood ($52), which I much preferred to the Single Barrel 15-year ($55). All of Balvenie's Scotches are on the sweet side, which makes them more approachable to occasional drinkers. The Doublewood -- I can't say I approve of the name, but it's just a name -- opens with rich molasses notes and has hints of red berries, with Sherry on the finish. Add a wee drop of water and it's gentler and a little less sweet, with more of a toffee finish. Anyway, back to the debate about the Scotch that tastes like rum. I don't think of myself as a prescriptive critic. In fact, that's a big reason I stopped writing movie reviews: Who am I to tell Hollywood to put fewer explosions in its films when they believe that's what sells tickets? It's also the reason I haven't jumped on the bandwagon of wine critics criticizing high-alcohol wines. Who am I to tell a winery not to make a profit? However, there's another school of thought that says a critic's job is to point out the intellectually flawed. Narsai was dismissive of the rum casked-Scotch from the beginning, saying with all the great rums in the world, this was just a waste of time. He tasted it and immediately set it aside. Maybe he's right. I loved drinking it -- it was the only glass I emptied -- but it was free; I wouldn't spend my own money for it. I do spend that much for spirits occasionally, but with my wallet, not my keyboard, I tend to agree with his philosophy. The last few spirits I paid more than $100 for were well-aged bottles of Calvados and Armagnac. Narsai's a radio guy; if our debate had been broadcast, he would have won easily, because he shifted the topic to "Sideways" and "Bottle Shock." I admitted that I enjoyed both, though for different reasons: "Sideways" is a good movie; "Bottle Shock" is a likable, if also mostly fictional, bad movie. Narsai pinned me down on this point: "So you're willing to say you enjoyed a movie if it entertains you, even if it's completely fictional and without artistic merit?" I stipulated to that. Yes, I am. I took the same position on the rum-casked Scotch. It entertained my palate. I guess I give it one tongue up. But I do see both sides of the dilemma of deliciousness.